All recompiled with the latest compiler! The workbooks for Excel 32 bit and 64 bit are the same unless the workbook contains VBA scripts that refer to BfX functions. Download the correct one! 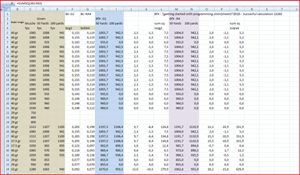 I fear that I cannot test the workbooks for the Excel 2003, 2007, 2010, 2013 versions anymore. 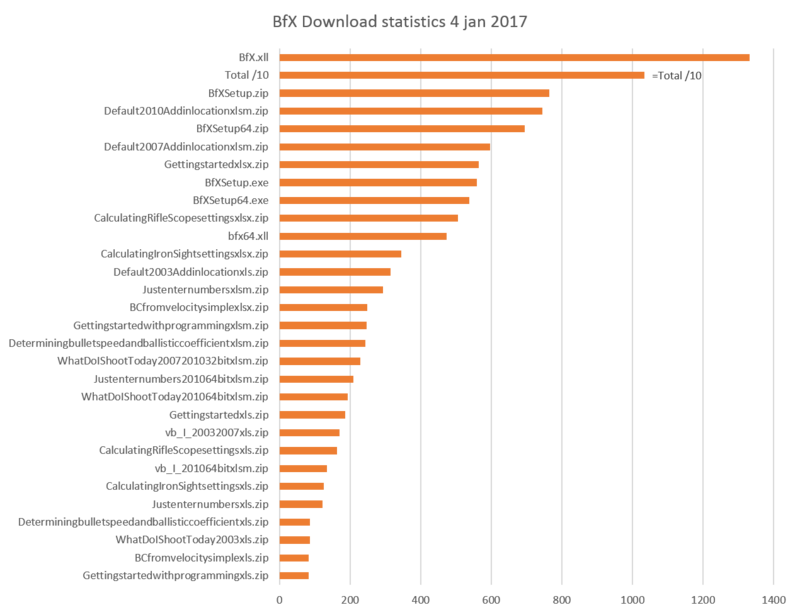 Click to see what popular downloads are. Obtain the setup files (zipped), unpack them and run BfXSetup.exe. You need to enter an installation directory. Download of BfX.xll or bfx64.xll makes sense if you yust want to replace the installed one with a newer version of it. Not necessary to download these files if you use the automatic installer files. 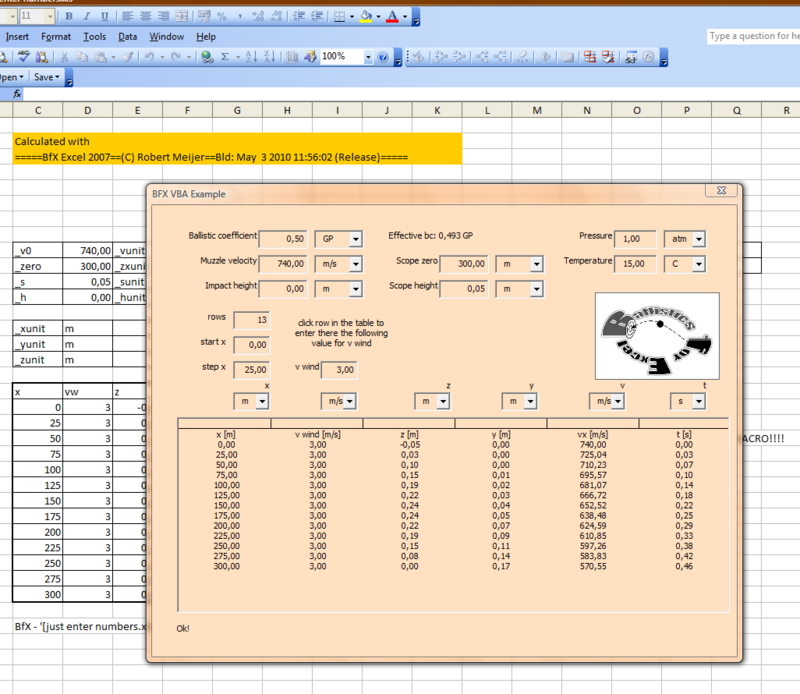 For Excel 2003, 2007, 2010, 2013, 2015 32 bits download the latest BfX.xll. 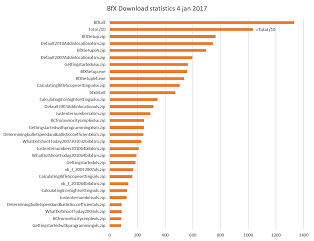 For the 64 bits Excel 2010, 2013, 2015 download the latest bfx64.xll. For installation instructions look here. What are the sight settings for a given distance? 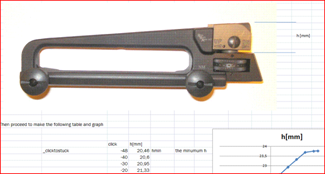 The (zipped) Excel 2003 or Excel 2007-2015 workbook shows you how to calibrate your iron sights and to compute ballistic tables for your rifle. How can I calculate my rifle-scope settings? 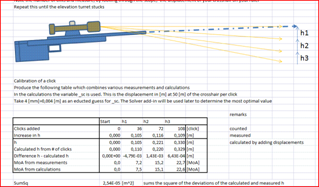 A calibration procedure for rifle scopes and the generation of associated ballistic tables is explained by this Excel 2003 or this Excel 2007-2015 workbook (zipped). I need the BfX declarations for my Visual Basic for Applications (VBA) program! 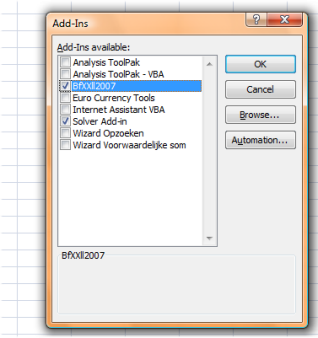 For Excel 2003, 2007 and the 32 bits Excel 2010-2015 download this text file that contains the VBA interface declarations to BfX.xll. Note: all VBA workbooks require some editing to set the proper path to bfx(64).xll! Show me an example of a BfX VBA program? A nice interactive ballistic calculator (Excel 2003, Excel 2007-2015 32bit) created with VBA and BfX shows you how to program in VBA. A worksheet performs exactly the same calculations (zipped). This is the download for the 64 bit Excel 2010 - 2015. Looking for a rather advanced VBA program? Show me how Solver can be used with BfX VBA? 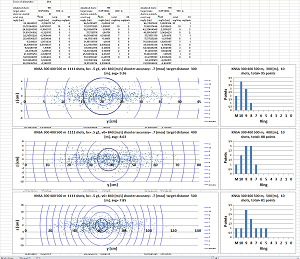 Find with a VBA procedure the ballistic coeficients for bullets listed in a table that also contains down range velocities. Download this Excel 2003 or this Excel 2007-2015 workbook (zipped). 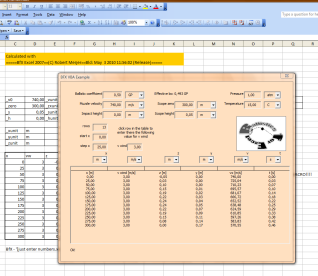 This workbook hosts a simulator with which you can estimate your results in a (multi distance, multi target) match, e.g. the NRA 90 shot full bore regional match course. Results are affected by wind conditions and the accuracy of the shooter and equipment. 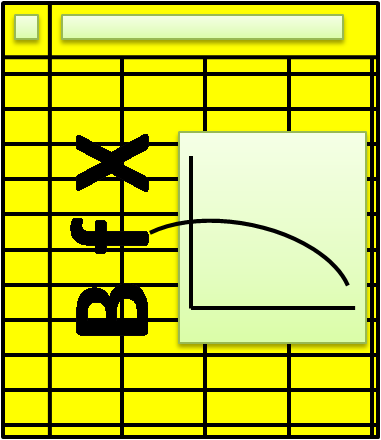 This workbook is a simple example of the use of the interpolation function bfx_i and its VBA equivalent vb_bfx_i.